A masterpiece. 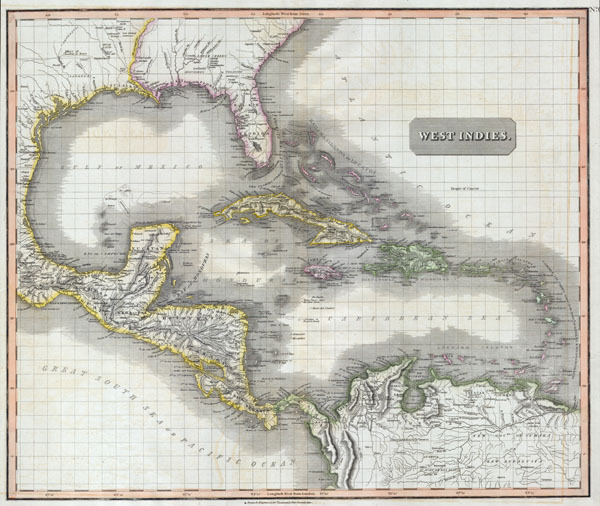 This fascinating hand colored 1814 map by Edinburgh cartographer John Thomson depicts the West Indies and Central America. Covers from the Carolinas south through Texas, Mexico and central America to the northern part of South America as far as Venezuela and the Orinoco Delta. Includes all of the West Indies islands including the Caribbean and the Greater and Lesser Antilles. Extraordinarily details with notations on both physical and political features, as well as undersea elements, banks, and shoals. Notates several American Indian tribes in both North and South America. This map's magnificent size, beautiful color, and high detail make this one of the finest maps of this region to appear in the early 19th century.